Despite more than a decade of extensive, international efforts to characterize and understand the increased symptom and illness-reporting among veterans of the 1991 Gulf War, concern over possible long-term health effects related to this deployment continue. The purpose of this study was to describe the long-term hospitalization experience of the subset of U.S. Gulf War veterans still on active duty between 1994 and 2004. Gulf War veterans on active duty rosters as of October 1, 1994, were identified (n = 211 642) and compared with veterans who had separated from military service and then assessed for attrition at three-year intervals during a 10-year follow-up period, examining demographic and military service characteristics, Gulf War exposure variables, and hospitalization data. Cox proportional hazard modeling was used to evaluate independent predictors of all-cause hospitalization among those still on active duty and to estimate cumulative probability of hospitalization, 1994–2004, by service branch. Members of our 1994 active duty cohort were more likely to be officers, somewhat older, and married compared with those who had separated from the military after serving in the 1991 Gulf War. Selected war-related exposures or experiences did not appear to influence separation with the exception of in-theater presence during the brief ground combat phase. Overall the top three diagnostic categories for hospitalizations were musculo-skeletal, injury and poisoning, and digestive disorders. Diseases of the circulatory system and symptoms, signs, and ill-defined conditions increased proportionately over time. In-theater hospitalization was the only significant independent predictor of long-term hospitalization risk among selected war-related exposures or experiences examined. The cumulative probability of hospitalization was highest for Army and lowest for Marines. Our results were generally consistent with a previous hospitalization study of US Gulf War veterans for the period August 1991 to July 1999. Although lack of a comparison group for our study limits interpretation of overall findings, intra-cohort analyses showed no significant associations between long-term hospitalization and war-related exposures or experiences, with the exception of in-theater hospitalization, within our active duty subset of 1991 Gulf War veterans. Concern for the health of individuals reporting symptoms or illnesses following service in the 1991 Gulf War led to wide-ranging, international investigations for over more than a decade that attempted to characterize a unique syndrome and/or identify possible deployment-related causes [1–23]. Some specific exposures investigated include smoke from oil well fires [24–28], nerve agents released during munitions demolition at Khamisiyah, Iraq [28–38], immunizations [12, 39–48], pesticides [41, 44, 45, 47, 49–54], chemical warfare nerve agent prophylaxis [45, 47, 52, 53, 55–60], and other exposures (single or multiple), including psychological stressors [41, 44, 50, 52, 53, 58, 61–73]. While several researchers have reported associations between some Gulf War exposures and specific health effects [34, 36, 41, 56], epidemiologic studies to date have not provided strong and consistent evidence for a causal relationship between putative exposures and the full array of symptoms and illnesses associated with deployment to the 1991 Gulf War [19, 66, 68, 74–80]. Previous studies have examined the early postwar hospitalization experience of U.S. Gulf War veterans compared with non-deployed era veterans and found no unexplained differences for most diagnostic categories [81, 82]. Excess hospitalizations among Gulf War veterans for some diagnoses were most often viewed as a consequence of deferred treatment, postwar adjustment to the stresses of war, or participation in a Gulf War health registry program with admission to hospital for advanced diagnostic procedures [81–85]. Investigations of the association between specific environmental exposures and hospitalization among deployed Gulf War veterans have not demonstrated increased overall risk among those exposed [26, 28, 29, 32, 33]. Lastly, longitudinal studies of mortality among U.S. and U.K. Gulf War veterans have not shown significant differences in overall risk of death due to disease among those deployed to the Gulf compared with non-deployed comparison groups [30, 54, 86–88]. Excess deaths due to unintentional injury (primarily motor vehicle crashes) among Gulf War veterans were observed for up to seven years post-war, but subsequently became comparable to the risk among non-deployed [30, 54]. However, a recent report suggested increased cause-specific risk of death from brain cancer among Gulf War veterans potentially exposed to munitions demolition at Khamisiyah . Thus, concern over possible long-term, adverse health outcomes from war-related exposures has persisted more than 15 years since the end of the 1991 Gulf War. Our study focuses on a subset of Gulf War veterans who were on active duty as of October 1, 1994, and describes their long-term hospitalization experience in three-year intervals over the decade from 1994 to 2004. The purpose was to characterize this active duty subset over time and examine hospitalization as an objective measure of long-term morbidity. We evaluated the effect of selected war-related exposures or experiences on hospitalization by service branch, while adjusting for demographic and military service characteristics. All regular active duty US military personnel deployed to the 1991 Gulf War (n = 584 341) were identified by the Defense Manpower Data Center (DMDC), Seaside, California, USA. We examined attrition over time to select a point at which approximately 50% of this population was still on active duty, to allow for the usual troop reductions after a large scale combat operation and to focus on men and women more likely to represent those continuing a military career. Among those deployed to the Gulf War, 265 690 were still listed on active duty rosters as of October 1, 1994. Of this group, 1281 had no DMDC record available for the Gulf War period, leaving 264 409 in our study population. Demographic and military service characteristics, selected Gulf War exposure variables, and Department of Defense (DoD) hospitalization data were obtained from databases maintained at DMDC, the Naval Health Research Center (NHRC), San Diego, California, USA, and the US Army Center for Health Promotion and Preventive Medicine (CHPPM), Aberdeen Proving Ground, Maryland, USA. DMDC provided demographic and military service data, and the following variables were used to characterize our study population at the time of the Gulf War and at three-year intervals during the follow-up period: age (16–22, 23–26, 27–31, 32–61; quartiles based on distribution as of October 1, 1994), gender, marital status (single, married, other), race (black, white, other), service (Army, Navy, Air Force, Marine Corps), and pay grade (officer, enlisted). In addition, military occupation was categorized into 10 groups based on the DoD 2001 Occupational Conversion Index , and for multivariable modeling, dichotomized into combat specialists versus other. We used wartime demographic and military profiles as the basis for observing changes in our active duty cohort and as covariates in time-to-event modeling. Available environmental exposure data from NHRC and CHPPM included information on potential exposure to munitions demolition at Khamisiyah (March 10–12, 1991) and smoke from oil well fires. The basis for establishing exposure status with respect to Khamisiyah and oil well fires has been previously described [26, 33, 90]. For purposes of multivariable modeling, we used a three-level Khamisiyah exposure variable (presumed not at risk; at risk of exposure but not exposed; and exposed). Other war-related exposures or experiences, including anthrax and/or botulinum immunization, in-theater hospitalization, and presence in theater during ground combat operations (February 24–28, 1991) were all treated as dichotomous variables. We assessed the distribution of wartime demographic and military characteristics and deployment-related exposure variables at the start of four time intervals (1995–1997, 1998–2000, 2001–2003, and 2004) based on the federal fiscal year (FY), starting October 1 and ending September 30. 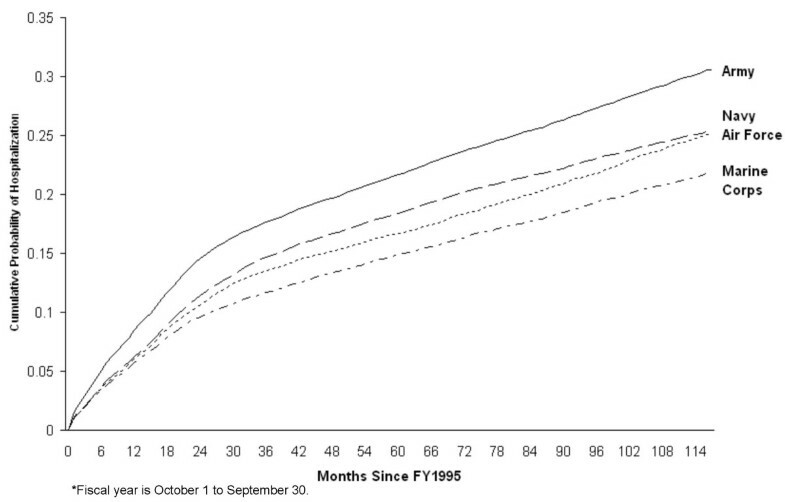 For example, FY 1995 corresponds to October 1, 1994, through September 30, 1995. We then evaluated hospitalizations during the entire 10-year period of observation (October 1, 1994, to September 30, 2004), as well as over each time interval, to identify the most frequently diagnosed conditions and any observable trends. To reduce possible effects of other deployments, we excluded any service member who deployed between the end of the Gulf War and the beginning of our period of observation (n = 49 502). After further excluding individuals with missing covariate data (n = 3265), our final analytic data set for multivariable modeling (time-to-event) included 211 642 individuals. Hospitalization data between October 1, 1994, and September 30, 2004, consisted of inpatient encounter records from military treatment facilities, as well as civilian facilities when costs were reimbursed by the DoD. Up to eight discharge diagnoses are recorded for each hospitalization based on International Classification of Diseases, 9th Revision, Clinical Modification (ICD-9-CM) codes. We included 14 major ICD-9-CM diagnostic categories related to illness or injury in our analysis, excluding congenital anomalies and pregnancy-related categories. In order to capture the full array of medical conditions for which individuals might be hospitalized, we considered both primary and secondary diagnoses. Individuals could be counted in multiple diagnostic categories, but just once per category. Additionally, in-theater hospitalization data for individuals in our study population were also available for analysis. We used Cox proportional hazards modeling to evaluate independent predictors of all-cause hospitalization, while adjusting for covariates and accounting for varying lengths of follow-up. Initial data exploration included bivariate analyses, Kaplan-Meier survival analysis, and the log-rank test for equality across strata to assess proportionality over time for each covariate, followed by regression diagnostics to assess collinearity. Finally, potential confounding and effect modification were assessed through exploratory time-to-event modeling. All covariates were considered eligible for inclusion in the final Cox regression model if they did not exhibit collinearity and met the assumption of proportional hazard over time. Variables related to immunization, oil well fire smoke exposure, potential nerve agent exposure, and presence in theater during ground combat were all retained as covariates, despite lack of significance, to address ongoing general public and veteran concerns and to quantify the influence of these exposures. We modeled the number of months from October 1, 1994, until first hospitalization for any cause. Observations were censored at separation from military service, death, subsequent deployment (Bosnia, Kosova, or Southwest Asia), or end of study period, whichever occurred first. Analyses were performed using SAS® software, version 9.1 (SAS Institute, Cary, North Carolina, USA). The protocol for this study was reviewed and approved by the Institutional Review Board at the Uniformed Services University of the Health Sciences and the Naval Health Research Center and was conducted in compliance with all applicable federal regulations governing the protection of human subjects in research. Table 1 compares Gulf War veterans in our active duty study population at the beginning of the observation period with those who had separated from military service prior to October 1, 1994. Our active duty subset tended to be slightly older, married, and officers. Gender and race were comparable between the two groups. Among the service branches, there were some notable differences, with Navy and particularly Air Force personnel tending to remain on active duty and Army and Marine Corps personnel more likely to have separated. Comparing occupational categories, those in electrical/mechanical repair were more likely to remain on active duty in contrast to those in electronics repair and combat specialists, who were more likely to have separated from military service. For war-related exposures, there were no substantial differences between those who stayed on active duty and those who separated, except for presence in the theater of operations during the five days of ground combat. Overall, about 85% of deployed service members were in theater during ground combat (data not shown). By October 1, 1994, about 78% of those still on active duty had been in theater during this combat period compared with 91% of those who had separated from military service. Table 1 also shows the distribution of demographic and military service characteristics at three-year time intervals for those remaining on active duty. With the exception of age, the proportions remained relatively consistent over time, including service branch. As expected, the oldest age category was less represented in the population remaining on active duty over time. Table 2 shows the distribution of ICD-9-CM diagnostic categories (including primary and secondary diagnoses) for inpatient encounters during the 10 years of follow-up. The most frequent categories were diseases of the musculoskeletal system (32.7%); digestive system (23.4%); injury and poisoning (21.0%); symptoms, signs, and ill-defined conditions (18.7%); circulatory conditions (14.7%); mental disorders (13.8%); and respiratory conditions (12.2%). We also examined the top five primary diagnoses within each of the 14 diagnostic categories over the entire follow-up period (Table 3). The following briefly describes the proportion of individuals with the most common primary diagnoses within the categories mentioned above. For musculoskeletal system diseases, 24.5% had a diagnosis of internal derangement of the knee and 18.3% had intervertebral disc disorders; within digestive diseases, 17.3% had inguinal hernia and 11.8% acute appendicitis. Within the injury and poisoning category, 9.2% had complications of procedures, 7.7% ankle fractures, and 7.0% sprains and strains of the knee and leg. For ill-defined conditions, 46.6% had respiratory system and other chest symptoms, and 22.3% had general symptoms. Within diseases of the circulatory system, 15.5% had cardiac dysrhythmias, 14.8% other chronic ischemic heart disease, and 13.5% hemorrhoids, while for respiratory system diseases, 24.3% had deviated nasal septum, 12.1% unspecified pneumonia, and 11.7% chronic disease of tonsils and adenoids. Finally, in the category of mental disorders, 33.1% had alcohol dependence syndrome and 29.6% adjustment reaction. ICD-9-CM: International Classification of Diseases, 9th Revision, Clinical Modification. FY: Fiscal year (October 1 through September 30). * Each individual could only be counted once (primary or secondary diagnosis) within a particular diagnostic category, but could be counted in multiple categories. † Percentages do not add to 100% because hospitalization for each individual could be counted in more than one category. Examining hospitalizations at three-year intervals, the leading diagnostic categories remained consistent over time, although some changes occurred in rank order, and diseases of the circulatory system gained prominence, increasing from 9.4% in the FY 1995–1997 time interval to 25.1% in FY 2004 (Table 2 and Figure 1). Similar proportional increases occurred over time for endocrine, metabolic, and immunity disorders; mental disorders; and symptoms, signs, and ill-defined conditions. 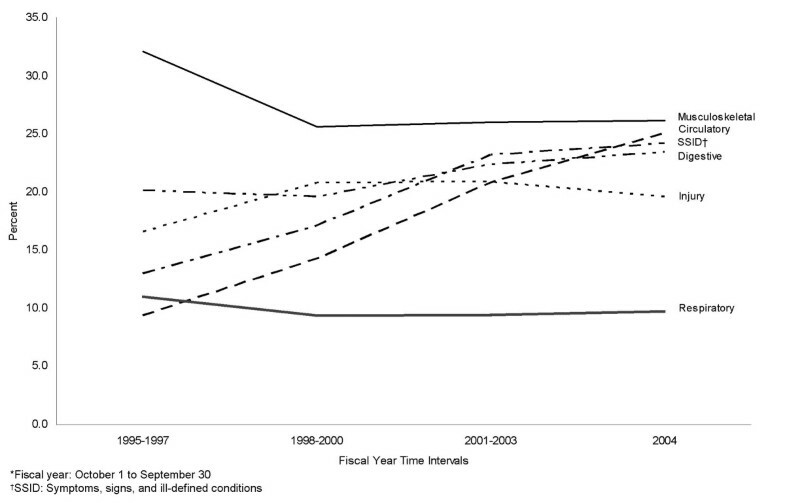 Changes in relative proportions of selected diagnostic categories for hospitalized individuals who served in the 1991 Gulf War and remained on active duty, fiscal years* 1995 to 2004. There were 4800 in-theater hospitalization records for our study cohort. Overall, the most frequently encountered diagnostic categories (data not shown) were injury and poisoning (28.3%); diseases of the digestive system (19.4%); symptoms, signs, and ill-defined conditions (12.4%); and diseases of the musculoskeletal system and connective tissue (12.3%). Except for differences in rank order, these were consistent with the top four diagnostic categories for hospitalizations during the entire follow-up period of our study. Time-to-event modeling was stratified by service branch because the assumption of proportionality over time was not met. The cumulative probability of first hospitalization is presented in Figure 2. Long-term hospitalization risk was highest for Army (31% over 9.8 years) and lowest for Marine Corps (22% over 9.7 years). Adjusted risk ratios for selected covariates are provided in Table 4. Female gender and being married were independent predictors of hospitalization for all services, and hospitalization risk increased with age. There was some variability among the service branches with respect to race and hospitalization risk. For Army, those categorized as white race had a slightly increased risk compared with black race. Cumulative probability of first hospitalization for any cause by service branch among military personnel who served in the 1991 Gulf War and remained on active duty, fiscal years* 1995 to 2004. * RR: risk ratio; adjusted for all other covariates in the model. ‡ Other: heterogeneous group, including Asian American, Hispanic, and Native American, among others. § Immunizations data not complete. # Only Army and Air Force data available for Khamisiyah munitions demolition exposure. Other independent predictors of hospitalization consistent across services included enlisted rank and history of in-theater hospitalization. Enlisted rank was associated with a reduced risk of hospitalization, whereas a history of in-theater hospitalization increased subsequent long-term hospitalization risk. Presence in theater during ground combat was a predictor of hospitalization for Navy only, and combat specialists in the Air Force and Marine Corps (but not Army and Navy) were at reduced risk of hospitalization compared with other occupational groups. Understanding the complex, interrelated health issues associated with the 1991 Gulf War has proved challenging and is not completely resolved. Our study focused on describing the hospitalization experience of those who were still on active duty at least three years following the 1991 Gulf War because of interest in retention and resiliency issues. We characterized those with career longevity and examined hospitalization as an objective measure of morbidity in this subgroup for up to 13 years following service in the Gulf War. Demographic and military characteristics appeared to have influenced separation from military service more than specific war-related exposures or experiences, with the exception of presence in theater during the brief ground combat phase. How these characteristics influence separation may well represent a predictable exodus of young, single, infantry personnel leaving the military following any large-scale combat operation, since significant attrition is not surprising as an aftermath of a large military build-up. In addition, evolving career goals, especially among young recruits completing an initial tour of military duty, may also play an important role in losses from the military. On the other hand, service members who had negative experiences or poor health related to deployment may have been more likely to separate from military service and been lost to follow-up. The total number of individuals hospitalized at least once over the 10-year period of observation was 43 346 (16.4% of the 264 409 active duty Gulf War veterans assembled for follow-up at the start of FY 1995). This proportion is somewhat less than the 19.4% of active duty Gulf War veterans previously reported hospitalized at least once between August 1, 1991, and July 31, 1999 [21, 26]. Fitness for duty standards clearly result in some premature separations from military service due to serious medical conditions, both physical and mental. However, it is possible that the demographics of our subpopulation with career longevity may be indicative of a healthier occupational cohort due to social and behavioral factors, notwithstanding the expected increase in chronic medical conditions related to advancing age over time. Hospital discharge diagnoses (primary or secondary) among individuals hospitalized in the current study most frequently fell within categories related to musculoskeletal, digestive, injury, ill-defined, and circulatory conditions (Table 2). This was not surprising for a cohort with nearly 25% age 32 years or older at baseline (and nearly 50% 27 years or older) and aging over the 10-year period of observation. If we consider as a point of reference, the top five diagnostic categories for hospitalizations among all U.S. Armed Forces during comparable time periods, the only notable difference was in the category of mental disorders, which was consistently under-represented in our study population. It is noteworthy that for all of DoD, mental disorders ranked among the top two major diagnostic categories (excluding pregnancy-related conditions) between 2000 and 2004 , while for our Gulf War-deployed, active duty subset, mental disorders did not rank among the top five. This probably reflects some attrition related to serious psychiatric disorders, as well as proportional increases in those chronic conditions associated with aging. For example, circulatory conditions steadily increased over the study period, as did diabetes, which was the primary underlying basis for the increase over time in the category of endocrine, nutritional, and metabolic diseases. Musculoskeletal conditions were the most frequent hospital diagnoses over the 10-year period of observation, which was similar to the distribution for DoD-wide hospitalizations (excluding pregnancy-related conditions) until more recent years, when DoD numbers for this diagnostic category showed a relative decline [91, 92]. Late effects of injury or chronic, progressive musculoskeletal conditions may account for continued dominance of this diagnostic category in our study population and is also consistent with advancing age. Further investigation of the circumstances, as well as long-term outcomes of injury-related musculoskeletal conditions, would be informative, and, more importantly, could result in focused prevention strategies. Our time-to-event modeling results were generally consistent with a previous hospitalization study of US Gulf War veterans covering the period from August 1991 to July 1999 . In our study, Army personnel were more likely to be hospitalized compared with other services, even though relative proportions of active duty service members by service branch remained stable over time. There were no notable differences in the distribution of diagnostic categories for hospitalizations by service branch that might have provided additional insight. Consistent with results from previous studies of 1991 Gulf War veterans [33, 81, 93] and medical surveillance reports regarding DoD-wide hospitalization rates [91, 92, 94, 95], women were more likely to be hospitalized than men. Based on available DoD-wide data, the female-to-male crude rate ratio for hospitalizations, excluding pregnancy-related causes, was 1.6 in 2000 and 2001 and 1.5 in 2003 and 2004 for the active duty component [91, 92, 94, 95]. In our study, adjusted rate ratios for females compared with males were similar across service branches (1.7 for Army, 1.9 for Navy, and 1.8 for Air Force), although slightly higher (2.2) for Marines. Also, independent of gender, married service members were more likely to be hospitalized. Family responsibilities or other circumstances may influence vulnerability to the experiences of war, or perhaps married individuals may be more likely to seek health care than their unmarried counterparts. We found no increased risk of hospitalization associated with either potential exposure to nerve agents at Khamisiyah or smoke from oil well fires, again consistent with earlier hospitalization studies [26, 29, 33]. On the other hand, in-theater hospitalization was a predictor of long-term, postwar hospitalization across all service branches. This finding has not been previously reported. Because ascertainment of in-theater hospitalizations was not complete , we may have underestimated the magnitude of the association between this and subsequent long-term hospitalization. This finding may warrant further investigation. Among those who were present in theater during ground combat, there was some variation in the risk of long-term hospitalization by service branch. Navy personnel had a slightly increased risk, while for Army and Air Force, the risk was reduced but not statistically significant. A possible explanation is that in-theater Navy personnel who go ashore tend to be elite combatants or part of construction battalions known as Seabees. Gray et al. reported that Seabees deployed to the Gulf War were more likely to self-report smoking, newly diagnosed digestive diseases or depression, and one or more hospitalizations since August 1990, compared with Seabees deployed elsewhere or not deployed . Finally, occupation was a risk factor for long-term hospitalization only for Marines and Air Force personnel, with combat specialists having a reduced risk. We might surmise that combat specialists in the Air Force are more likely to include individuals with technologically advanced training and education, who may typify a health and safety-oriented group. Similarly, frontline Marine combatants may belong to a sub-population that selects for those with lower long-term hospitalization risk. Overall, the Marines had a lower cumulative probability of hospitalization than the other services. The strengths of our study include 10 years of follow-up of a well-defined population of active duty service members from the 1991 Gulf War cohort with near complete ascertainment of an objective health outcome measure. On the other hand, we did not have a comparison group of non-deployed service members from the same era, nor could we ascertain hospitalizations among service members in our study cohort who separated from military service. Thus, restricting our analyses to Gulf War-deployed, active duty personnel introduced a selection bias and is a limitation of our study. Individuals with serious and debilitating injuries or illnesses following deployment would not meet fitness for duty standards, most likely leading to separation from military service. Additionally, once individuals are separated from the military, complete hospitalization data for are not readily accessible for analysis. Finally, hospitalization is only a partial measure of long-term morbidity, and other sources, such as automated ambulatory data, might provide additional insight. We provide a description of the overall long-term hospitalization experience in the subset of Gulf War veterans with military service longevity. Intra-cohort comparisons by service branch present information on the influence of Gulf War-related exposures and experiences on subsequent long-term hospitalization. Multivariable modeling suggests that in-theater hospitalization was the only significant independent predictor of long-term hospitalization risk among the selected war-related exposures or experiences examined. Although analyses were limited to Gulf War-deployed veterans who remained on active duty, our results offer some insight into the relative importance of predictors for long-term morbidity within this subset using an objective outcome measure. Additionally, this investigation adds to our understanding of retention and resiliency following large-scale combat operations. We thank Scott L Seggerman from the Management Information Division, Defense Manpower Data Center, Seaside, California, for providing a sample of military personnel and their demographic and deployment data. We thank Michael J Boyle, Thomas A Rupp, Dr Francis L O'Donnell, and Dr Michael E Kilpatrick from the Deployment Health Support Directorate (formerly Office of Special Assistant for Gulf War Illnesses) for years of dedicated work capturing in-theater hospitalization data. We thank Dr Jack Heller, Chris Weir, Jeff Kirkpatrick, and Warren Wortman from the Deployment Environmental Surveillance Program of the US Army Center for Health Promotion and Preventive Medicine, Aberdeen Proving Ground, Maryland, for providing troop location and exposure data, and Dr Margaret A K Ryan from the DoD Center for Deployment Health Research, San Diego, California, for facilitating data sharing. We appreciate the support of the Henry M. Jackson Foundation for the Advancement of Military Medicine, Rockville, MD. This research was supported in part by a grant from the Department of Defense. The views expressed in this article are solely those of the authors and do not reflect the official policy or position of the Uniformed Services University of the Health Sciences, the Department of the Air Force, the Department of the Navy, the Department of Defense, or the US Government. Approved for public release; distribution is unlimited. All authors participated in study design, data acquisition, and interpretation of the results of analyses. KB and BN performed the statistical analyses. TH, SD, KB, BN, BS, and TS helped to draft the manuscript. TH and GG made revisions to the manuscript related to intellectual content. All authors read and approved the final manuscript.